To decide what is best for your requirements, read on. Don’t be fooled by vendors giving you all these technical jargons to intimidate you and turning you into a mouse when deciding to install your own cctv surveillance system – be it for the office or home. Many full featured models are now user operable just like your home television. For most application, you don’t need a security consultant, let alone a licensed security service provider in Singapore. Recording CCTV images in digital format is done using DVR (Digital Video Recorder) or NVR (Network Video Recorder). It’s useful to understand the major differences of DVR and NVR. Let’s agree hereon that VCR (video cassette recorder) is history. To begin, suffice to say that NVR is the future. But DVR has yet to see its end-of-life for a good many years more. DVR converts analog videos captured by the cameras into digital format and then compresses and stores them in storage devices. NVR, amongst others, stores the videos that are already digitally encoded by the cameras. Hence, the cameras required to work with DVRs and NVRs are different – they are analog cameras and IP cameras respectively. We will discuss the different cameras in details later. DVR needs to be sited close to the cameras whereas NVR does not. NVR allows for IP-based networks with distributed IP-cameras that may be sited at various locations or branches as long as they are accessible in a network. Digital videos are centrally recorded and stored. Due to its IP nature, it’s far easier to deploy redundancy of recording and storage if required. Access to IP-cameras is independent of NVR as each camera is addressable individually. It’s also easier to secure that video data compared to a setup with several DVRs at different locations. The main drawback for NVR is in the video data size. Since it generally captures in HD resolution (which is a good thing), the disk storage required would generally be much higher. However, there are many techniques available to mitigate high storage requirement. These will be discussed as we cover the specifications of DVR/NVR. Since the payload is heavier, the transmissions of video data (if there are many cameras at a site) may need bigger bandwidth. With proliferation of fibre broadband across Singapore, this is no longer a problem. Physically, the DVR comes in 4, 8, 16 and 32-ports or channels while NVR does not have the physical input ports at the back of the appliance. There is a new range of DVRs that support AHD where recording resolution can match that of the NVR and IP cameras. Recording Resolution - Do not mistake DVR recording resolution from the display resolution or the camera resolution. DVR recording resolution is important as the quality of the playback of the video captured is dependent on it. The most common reference for recording resolutions, in descending order, are 1080P, 720P, 960H, D1 (4CIF), 2CIF and CIF. The higher the resolution the clearer the image, but the bigger the data stored. Relative Comparison of 1080P, 960H and D1 resolutions. Note that some DVRs do not record “high’’ resolution on all channels. In some models, highest resolution could only be recorded on the first channel but not the rest. Recording Speed (Frame rate, fps) – Just as recording resolution, not all channels in DVR can record at the same highest speed. It’s worth to examine the DVR performance specification in this aspect. Higher fps will provide better quality playback. Low fps will result in “jerky” display. 25-30fps is considered normal speed. Recording resolution and fps are almost always tie to each other. Increasing recording resolution will require the reduction of fps. One needs to decide on the compromise for a given performance capability of the DVR. Some DVR are designed to provide one “high” end channel with the rest at “lower” recording quality to meet a target price point at a given performance capability. For most application, a D1@25fps would be sufficient. If your DVR has a rating of D1@120fps. With 4 channels, one can record D1@30fps per channel. Compression and H.264 – To be efficient, DVR compresses the video signal BEFORE storing or transmission. On playback, the quality of the video is almost always of lower quality to the original signal. Hence, while it’s good to have high resolution recording but fps setting will also degrade the quality of stored video arising from compression. H.264 refers to a compression standard that is currently very common in DVRs. Disk Space Requirement – To keep a record of 30 days at 24/7 for 4 cameras with D1@10fps, you would need 1.33TB (rough estimate). For most requirements, one won’t miss a thing even at 10fps. However, we can keep the record longer using other features – record on motion, etc. For NVR, to keep a record of 30 days at 24/7 for 4 cameras with 2MP@10fps, slightly more than 6TB is required. Audio Recording – Video recording generally do not have its accompanying audio unless you have camera with microphone. Do also note that not all channels can record with audio. DVRs come with 1 or more audio recording channels or none at all. Cabling – Cameras are connected to DVR by either RG59 or CAT5E/CAT6 cables. By using RG59, you would need a power source closer to each camera. Through CAT5E/CAT6, the power can be delivered via the cable using video balun. Depending on distance, such as >250M, one might need to consider different cable specifications to ensure signal integrity. PTZ Control - A pan–tilt–zoom camera (PTZ camera) is a camera that is capable of remote directional and zoom control. A DVR can manually control the PTZ camera or pre-programme the movement and zoom of the PTZ in automated mode. Mobile Support – Other than supporting remote monitoring on PC/Browser, most DVRs now allow for remote real-time viewing on smartphones (mainly Android, iOS or Windows). Todate, these mobile apps are generally available free. The setup may be a little daunting to non-IT person, especially if the IP address of the router is dynamic. In which case, you need a dynamic DNS service to enable remote access to the DVR or IP camera/s. 5-in-1 Recorder - Currently, most video recorders are now available that support all the popular formats - Analog (CVBS), AHD, TVI, CVI and IP. These come about as manufacturers understand that existing installations could made up of different cameras installed over time and there's a need to have a recorder to be compatible with the different cameras installed over time. Firstly, you need to know that analog camera works with DVR, while IP cameras work with NVR in a general sense though we have video encoder and decoder for such interface. Within analog cameras, there is a higher range of HD-SDI cameras that works best with DVR that support HD-SDI standards. Types – The general ones are indoor vandal-proof dome (or in bullet or box shape), outdoor weatherproof with mounting brackets (2-axis or 3-axis) or the non-static Pan-Tilt-Zoom (PTZ) cameras. For the harsh tropical weather of Singapore, ensure that the weatherproof model has enclosure that is compliant to IP66. CCD Sensor – The core component of the camera is the CCD (Charge Coupled Device) sensor. This component converts light into electrical signal and then into video output. On analog camera, these are then delivered to the DVR. For IP cameras, the compression and conversion are done before being transmitted to the NVR. Sensors from Sony and Sharp are the most common ones. We hardly find monochrome camera being considered anymore. Apart from manufacturers, you need to consider the chip size – bigger is better. Most commonly preferred in Singapore are those in 1/3-inch. Those in ½-inch are more sensitive and provide clearer picture. Avoid ¼-inch models. Camera Resolution – For analog models, it could come in 420 to 700 and even 1000 TVLs (TV lines). The higher the better. 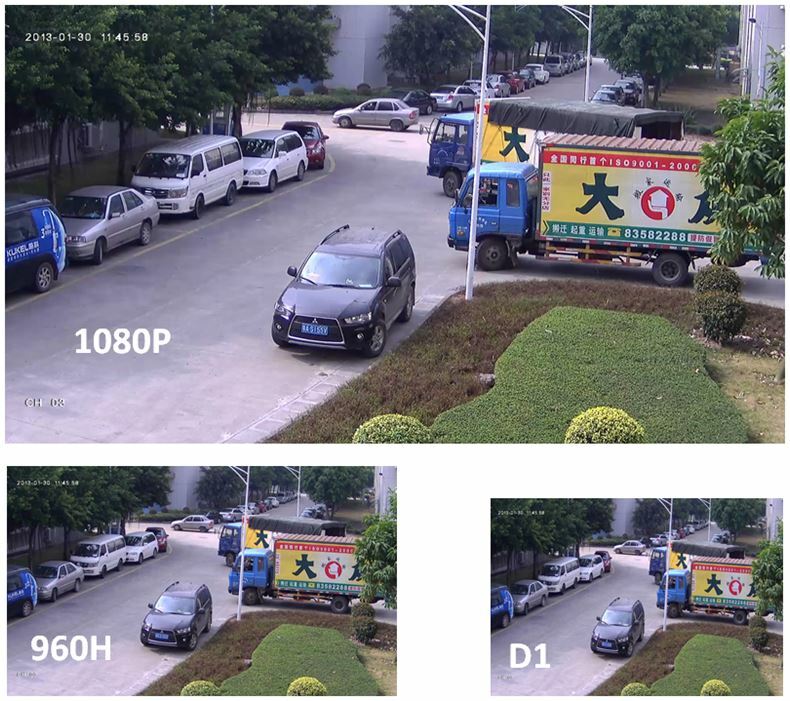 For matching purpose, 700TVLs should comfortably support DVR recording resolution at 960H. Digital models (IP cameras) range from 1MP (Megapixels) to 3MP and even more. As a rough guide - 1000TVLs analog model would match 1MP digital model in quality. There’s another range of analog model that supports AHD that provide camera resolutions of 1920 x 1080 pixels that is equivalent to 2MP. However, it will need a DVR that records in AHD to achieve the intended recording quality. IR LEDs – This refers to the cameras installed with LEDs. More LEDs are better. Cameras also come in distance rating from 20M to 60M or more. IR LEDs enable night vision and the numbers (together with others) will determine the distance it can sense. However, subjects that are too close to higher number of IR LEDs cameras (over- illumination) will appear white while subjects too far away from a lower number IR LEDs cameras will not be detected. Videos captured under low illumination appear in monochrome. Lens Focal Length (Fixed or Varifocal, in mm) – Varifocal is preferred to provide the flexibility to view wide scenes or close-up views. Lower mm specifications means wider view. For varifocal, a range is provided – for example, 2.8 – 12mm. Lens Speed (F-Stop) – Lower is better in low light. Lens with F-Stop f1.2 is better than f2.0 in the low illumination environment. Usable Illumination (in Lux) – Lower is better. Lower lux specification will need less light to produce a picture. OSD – On screen display is very useful when adjusting the camera settings. A good one should have it. Noise Reduction (2D, space-based or 3D, time-based) - NR improves image quality. Wide Dynamic Range (WDR) allows for different brightness for different areas on the same image making darker objects brighter and more visible. ONVIF – For NVR and IP-based cameras, look out for ONVIF standards. These ensure interoperability of cameras from different suppliers of NVR and cameras.